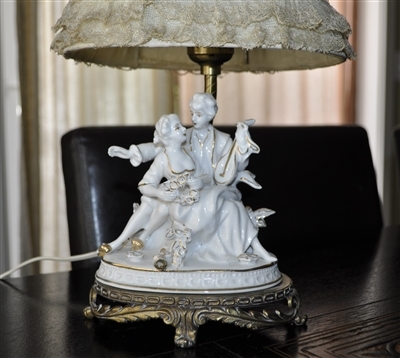 Romantic Boudoir table lamp with porcelain couple and antique gold tone base and lamp post. Original lampshade included but it needs refreshing or resurfacing, torn - it came with the lamp as is. Renaissance style design with a lovely couple submerged in a conversation. Exceptional white porcelain finish with shimmering gold applications. 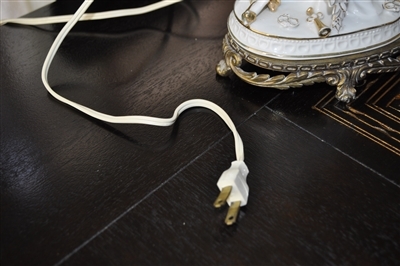 Excellent boudoir lamp and accent piece. 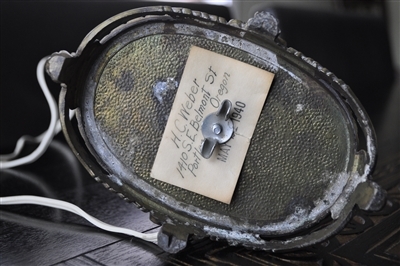 Antique gold tone base and post are all intact, patina present and shows more under the base. 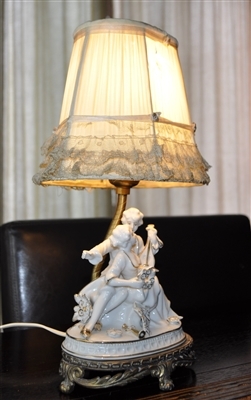 The lamp has included a note, with date and previous owner informations, that dates to 1940s possible purchase date. 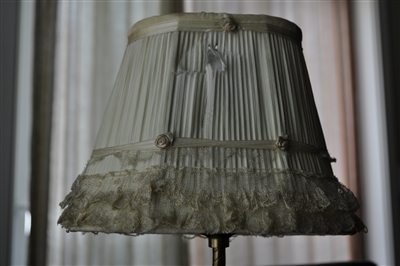 Lampshade is made of soft and light fabric that is giving the lamp a very appealing look. It is torn on both sides and needs to be refreshed or re done. Very nice lace and rose details. 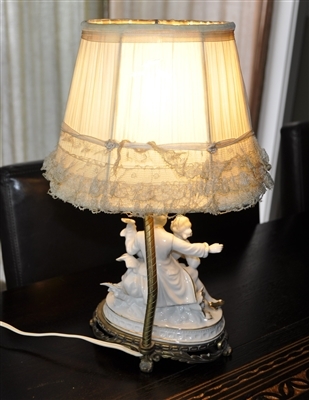 The lamp, including the shade, is 13-1/2 to 14" tall. Lampshade 8" long, 4-3/8" wide, and almost 6" tall. Beautiful vintage hanging ceiling light fixture with milk glass oval lamp shade, deep gold metal accents and long chain, hardwire. Vintage Amber glass grapes and vines decorated glass with metal elements accents. 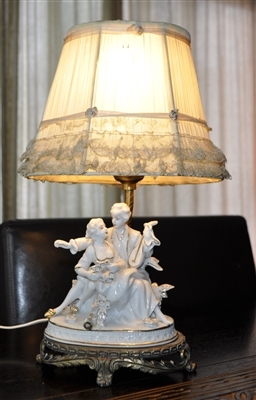 STIFFEL Hollywood Regency table lamp with glass tray. Vintage, porcelain Swordfish Nautical TV Lamp in Mid Century design. Two candle holder Angels playing instruments and cherub figurine all in antiqued gold tone finish decorations. Winnie the Pooh rotating shadow lamp collectible for babies room, in box. 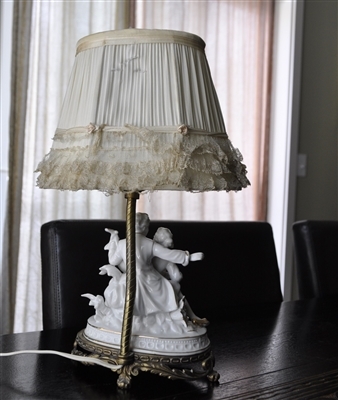 Vintage Alabastrite Resin Angel playing trumpet table lamp with an amazing hard plastic display lamp shade. 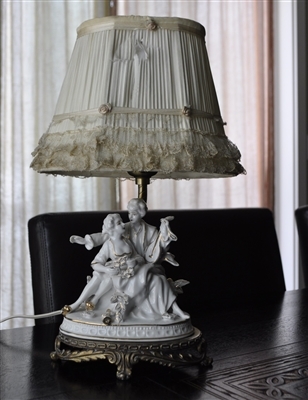 Vintage Alabastrite Resin Angel playing violin table lamp with an amazing hard plastic 3D lampshade.